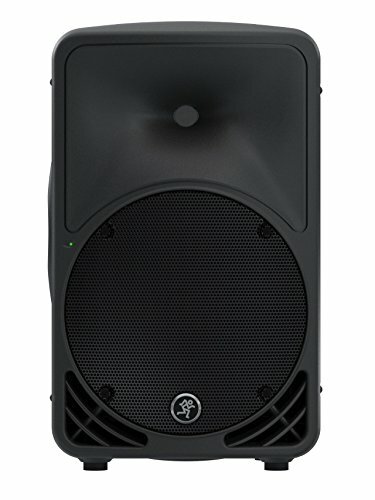 SRM350v3 1000W High-Definition Portable Powered Loudspeaker. "This is the second redesign of the popular SRM350. The version 3 iteration of this sound reinforcement industry standard offers numerous features unavailable on previous models. It is a 1000-watt powered enclosure with a 10"" LF driver and a 1.4"" HF compression driver, a precision two-way crossover and some output processing that you will really appreciate. The SRM350v3 has a ""built-like-a-tank"" chassis that is cut in such a way that it is also an excellent wedge floor monitor. Not only that, there is a voicing select switch that when engaged for monitor use, adds greater upper end clarity for vocal intelligibility and an enhanced feedback rejection. When using the SRM350v3 in a DJ context, the Speaker Mode switch adds just the perfect low end bump. It likewise has a setting optimized for solo entertainers. A flexible two-channel mixer is installed in the back panel as well, allowing you to use one SRM350v3 as an entire PA system. The built-in mixer features two XLR/TRS combination jacks, stereo RCA inputs and discrete gain controls for each channel. Lightweight, versatile, loud and clear. "